Preheat the oven to 220ºC/425ºC/gas 7. Using a sharp knife or a clean Stanley knife, score the lamb all over, ½cm apart and 3mm deep – this gives it the most amazing, gnarly, crispy surface and a blushing centre. Make the herby butter by putting the butter into a blender, pick in the thyme and rosemary, season well, then whiz to combine. Pop it into a bowl and set aside. Halve the unpeeled onions, separate and bash the unpeeled garlic cloves, then arrange in a large roasting tray. Spread the herby butter all over the lamb, then pop the meat on top of the veg. Roast in the oven for 10 minutes for every 450g, plus 20 minutes at the end, for blushing meat. Meanwhile, peel and chop the celeriac into 3cm chunks, and peel and chop the potatoes into 2cm chunks. Cook the celeriac and potatoes in a pan of boiling salted water for 15 to 20 minutes, or until soft. Drain, allow to steam dry, then mash with a good lug of extra virgin olive oil (or butter if you prefer), and season well with a little grated nutmeg and some sea salt and black pepper. 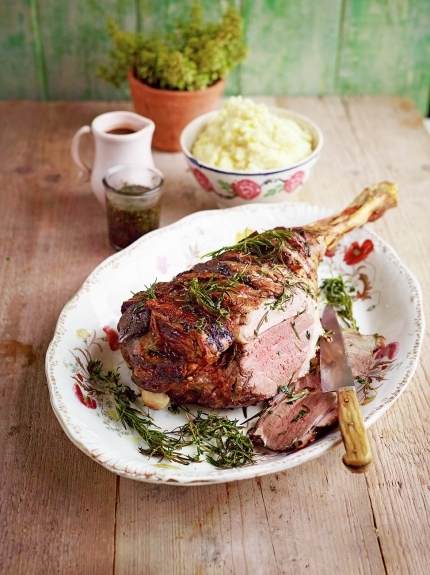 When the lamb is cooked, allow it to rest for at least 10 minutes, while you make the gravy. Set aside half a red onion to make the mint sauce, then squash the rest of the onions into the tray. Stir in the flour, a lug of port and the stock, then place over a high heat to allow the gravy to reduce, stirring continuously. Pass through a sieve and keep hot until needed. Pick and finely chop the mint. Pop the reserved onion half out of its skin and finely chopping it with the mint, then mix them together in a bowl with the vinegar and sugar. Take everything to the table, and dig in!